Obvious signs show that the 1MDB scandal has thrown Prime Minister Najib Razak into trouble. Regarding the 700 million US dollars remittance exposed by United States Wall Street Journal, Najib Razak tried everything possible to suppress the truth. 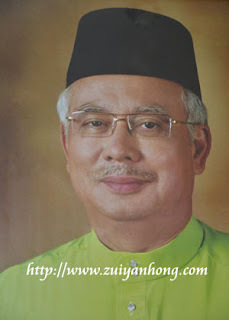 However under the condemnation of netizens, opposition leaders, former Deputy Prime Minister Muhyiddin Yassin and former Prime Minister Dr Mahathir Mohamad, Najib Razak had to clarify the remittance in his personal bank account is political donation. When Malaysians composed of different races turned up for Bersih 4 Rally, Najib Razak claimed that street demonstration is not Malaysia culture. Furthermore, he sneer at the Bersih 4 Rally-goers shallow and unpatriotic. Although his words still ringing in his ears, Najib Razak showed green light to UMNO members to participate 916 Red Shirt Rally. As the Prime Minister of Malaysia, Najib Razak shouldn't twist and turn his words. He had stated that street demonstration is not Malaysia culture but broke his promise for allowing UMNO members to join 916 Red Shirt Rally.